There is a tendency to say that people from Auvergne are frugal (even though the famous French singer Brassens sang otherwise) and unfortunately, clichés are hard to shake off. It is also said that people from this region resemble the land, however those who have already visited Auvergne thus know that it is impossible to believe the unkind cliché the Parisians hold. Indeed, those who are familiar with even a little bit of the nature and landscape in Auvergne know just how many attractions the region holds. Providing a very seductive contrast, Auvergne brings together water and fire! Water is represented by the eleven sources (Volvic, Saint Yorre...), which attract many visitors to the region and are a reason for its renown. Fire, on the other hand, is represented by the now extinct volcanoes. Whether it be Allier, Puy de Dôme, Cantal, or Haute Loire, the four departments comprising this region are all rich areas featuring a mixture of forests, hedged farmland, deep gorges and mountain pastures. However, each one has its own unique character. The home of Bourbon, Allier boasts great patrimonial wealth, which includes the Bourbon Archambault Castle, a true gem, and the Romanesque Notre-Dame de Châtel-Montagne church. The nature of Puy-de-dôme has been scrupulously preserved, making it possible to admire landscapes that are unique in Europe, like the Puys mountain chain, the Sancy massifs and the Livradois-Drill Natural Park. In Cantal, the trip takes on a different tone with a granite circus with lunar accents. Then there's Haute Loire. This department seems to have invented the concept of green tourism all on its own. There are countless walks to be taken in amidst fir tree forests, the gorges of the Loire and Allier rivers, and alongside the Romanesque churches, castles, and Roman routes. A region with wild, harsh, and majestic landscapes, Auvergne is a land proud of its agricultural traditions, where you can find various cattle varieties, like the Saler, cheeses with a strong taste such as Cantal or Salers, or more delicate foodstuffs, like fir tree honey. Disconcerting and seductive, Auvergne is truly a land of contrasts, where the plains mix with the giant Massif Central and where the mountain pastures overlook age-old forests. Finally, in Auvergne, the volcanoes are all extinct. 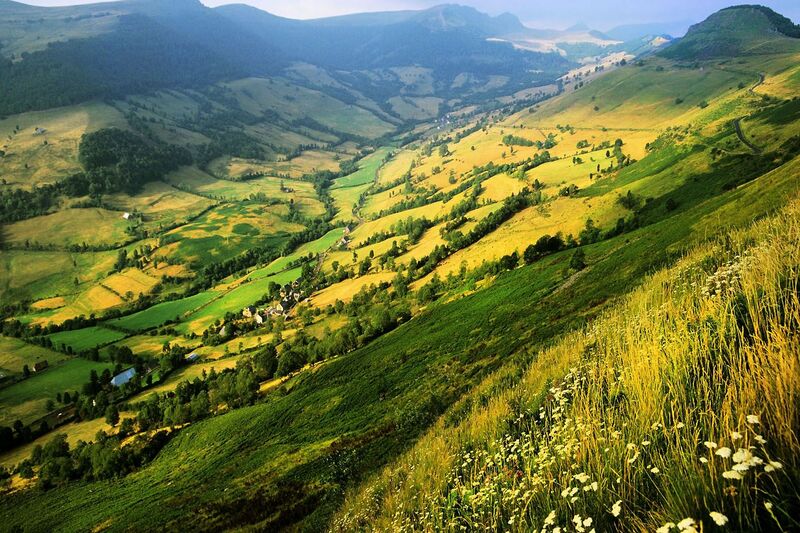 Auvergne is synonymous with nature and all the advantages that nature brings. Choosing this region as a holiday destination means choosing the great outdoors and all that is authentic. 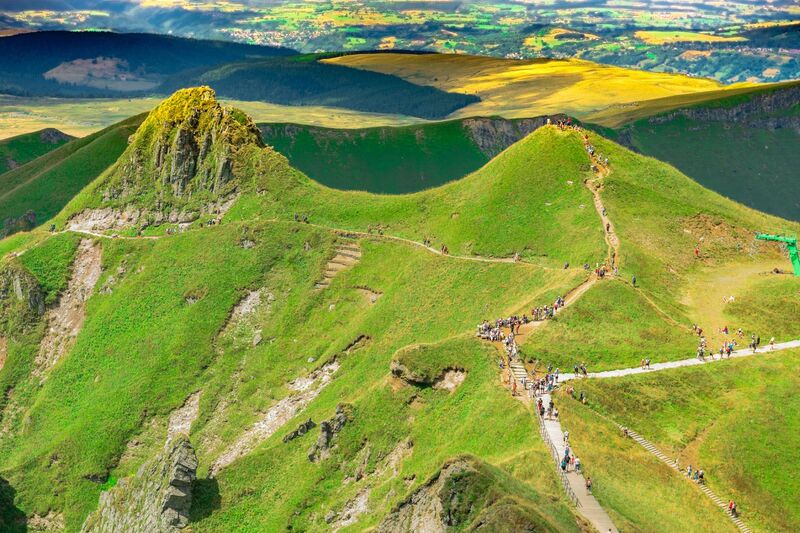 With its undulating relief, Auvergne is the ideal place for hiking and is sure to satisfy hikers of all levels. Those more experienced might enjoy the challenge of the region's dormant volcanoes (keeping in mind that they're not exactly the Alps), while those who prefer a more relaxed hike will appreciate the valleys of the Haute-Loire and its fir tree forests. A veritable gastronomic region, Auvergne is especially famous for its cheeses, and since they keep well, don't hesitate to bring some home with you to garnish your cheese platter. The most famous is of course Cantal, but don't forget Salers, Fourme d'Ambert, Bleu d'Auvergne and Saint Nectaire. All five of these benefit from a PDO label. A land that produces many of its own products, don't forget that Thiers is the capital of cutlery. The pocket, table and kitchen knives produced here are of the highest quality. Find weekly weather forecasts for Auvergne . Different criteria make it possible to predict with precision the best time of year to go to Auvergne . A comprehensive weather score, made up of temperature indicators, bad weather predictions, sunshine levels and wind speeds, will allow you to choose the activities best suited to the weather conditions and therefore make the most of your holiday in Auvergne .